Thai Iced Tea with Lime (Cha Ma-Nao ชามะนาว) is a staple at anything from the lowliest of khao-kaeng (rice-curry) stalls to school cafeterias, to little posh cafés, to sit-down family restaurants. People like it, apparently. While pairing wine or beer with Thai food can be tricky sometimes, and soda doesn’t always work (try drinking coca-cola with anything spicy that contains lemongrass and/or galangal — yuck), Cha Ma-Nao — ordinary as it may seem — hardly, if ever, fails. The combination of Thai tea and lime juice seems to go with just about any Thai dish. Put 4 cups of room temperature water in a pot and bring it to a boil. Turn off the heat. Add the tea and let it steep for 15-20 minutes. After 15-20 minutes have passed, add the sugar to the tea and stir until it’s completely dissolved. Add the cold water to the mixture to bring the hot tea to room temperature. Strain the sweetened tea into a large pitcher. Speaking pars pro toto, of course, since any given rice-curry stall always offers more than just rice and curries. If you’re afraid of using a product that contains artificial food coloring, replace Thai tea with the same amount of black tea and 2-3 pieces of star anise. It won’t taste the same, of course, but — I promise you — it will still be delicious. This looks great — love the addition of lime! Thai iced tea is one of my favorite, favorite things on earth. So glad you finally posted this! Have been searching the internet for recipes for Thai iced tea. Is the lime a ubiquitous addition? Used in place of dairy? Is the milk-flavored tea a different drink entirely? brillsec – there are generally three variations of Thai iced tea: 1. plain sweetened (Cha Dam Yen ชาดำเย็น) which would be exactly what’s featured here without the addition of lime juice, 2. sweetened lime tea (shown in this post), and 3. iced tea with either sweetened condensed milk or evaporated milk added (Cha Yen ชาเย็น). All of these are common and made with the same tea. This sounds very, very similar to a popular Malaysian drink called “Teh O Ais Limau” – literally translated as Tea with Ice and Lime. The “O” means zero, ie without milk. 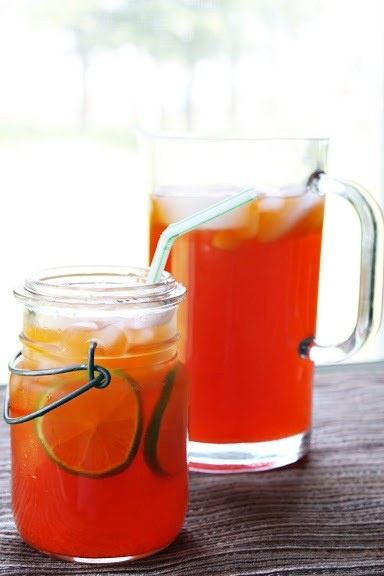 It’s sweet, zesty and oh so refreshing, and as you mentioned, goes with just about everything! I’ll have to try the Thai version next time. This recipe sounds yummy and so refreshing with the lime. I saw your comments to brillsec, and have to say, whenever I see Thai iced tea in the restaurant here in the states its always with the condensed milk, we’ve been robbed of some delicious sounding options. This sounds delicious… I’ve been looking to recreate this drink after having it in Bangkok. I was wondering if there is a particular brand you recommend for the tea. Natasha – I don’t have a favorite. But Pantai is easy to find and works well.